A collection of photos, audio and other information from Billy Graham’s historic Australian Evangelism Campaign. The above link will open in a new window. Mr. Graham preached the Gospel to more people in live audiences than anyone else in history—nearly 215 million people in more than 185 countries and territories—through various meetings, including Mission World and Global Mission. Hundreds of millions more have been reached through television, video, film, and webcasts. Beginning with the 1949 Los Angeles Crusade, which vaulted Mr. Graham into the public eye, he led hundreds of thousands of individuals to make personal decisions to live for Christ, the main thrust of his decades-long ministry. Born November 7, 1918, four days before the Armistice ended World War I, Mr. Graham was reared on a dairy farm in Charlotte, N.C. Growing up during the Depression, he learned the value of hard work on the family farm, but he also found time to spend many hours in the hayloft reading books on a wide variety of subjects. Ordained in 1939 by Peniel Baptist Church in Palatka, Fla. (a church in the Southern Baptist Convention), Mr. Graham received a solid foundation in the Scriptures at Florida Bible Institute (now Trinity College of Florida). In 1943 he graduated from Wheaton College in Illinois and married fellow student Ruth McCue Bell, daughter of a missionary surgeon, who spent the first 17 years of her life in China. After graduating from college, Mr. Graham pastored The Village Church of Western Springs (now Western Springs Baptist Church) in Western Springs, Ill., before joining Youth for Christ, an organisation founded for ministry to youth and servicemen during World War II. He preached throughout the United States and in Europe in the immediate post war era, emerging as a rising young evangelist. Many of his subsequent early Crusades were similarly extended, including one in London that lasted 12 weeks, and a New York City Crusade in Madison Square Garden in 1957 that ran nightly for 16 weeks. Today, Mr. Graham’s ministry is known around the globe. He preached in remote African villages and in the heart of New York City, and those to whom he ministered have ranged from heads of state to the simple living bushmen of Australia and the wandering tribes of Africa and the Middle East. Beginning in 1977, Mr. Graham was given the opportunity to conduct preaching missions in virtually every country of the former Eastern bloc, including the former Soviet Union. In 2013, Mr. Graham had the vision for proclaiming the Gospel across the United States and Canada, prompting the implementation of My Hope with Billy Graham, a grassroots evangelism outreach combining personal relationships with the power of modern media. Based upon a pioneering outreach that had already resulted in millions of decisions for Christ around the world since 2002, churches and individual Christians across the two countries were encouraged and equipped to pray and reach out to friends, family and neighbors using a powerful new film from BGEA. Approaching 95 years of age, Mr. Graham recorded a new video message, called “The Cross,” for the project, which was made available for use in homes and churches as a tool for sharing the Gospel. television programs that are still broadcast today on national Christian networks. Mr. Graham wrote 33 books, many which became top sellers. His autobiography “Just As I Am,” published in 1997, achieved a “triple crown,” appearing simultaneously on the three top best-seller lists in one week. In it, Mr. Graham reflected on his life, and decades of ministry around the world. From humble beginnings as the son of a dairy farmer in North Carolina, he shared how his unwavering faith in Christ formed and shaped his career. Mr. Graham’s most recent works included “Where I Am: Heaven, Eternity, and Our Life Beyond” (2015), “The Reason for My Hope: Salvation” (2013), “The Heaven Answer Book” (2012), “Nearing Home: Life, Faith and Finishing Well” (2011) and “Storm Warning” (2010). “Nearing Home” was selected as the 2012 Christian Book of the Year by the Evangelical Christian Publishers Association. Of his other books, “Approaching Hoofbeats: The Four Horsemen of the Apocalypse” (1983) was listed for several weeks on The New York Times best seller list; “How to Be Born Again” (1977) had the largest first printing in publishing history at the time with 800,000 copies; “Angels: God’s Secret Agents” (1975) sold one million copies within 90 days; and “The Jesus Generation” (1971) sold 200,000 copies in the first two weeks. Mr. Graham’s counsel was sought by presidents, and his appeal in both the secular and religious arenas is evidenced by the wide range of groups that have honored him, including numerous honorary doctorates from many institutions in the U.S. and abroad. Recognitions include the Ronald Reagan Presidential Foundation Freedom Award (2000) for contributions to the cause of freedom; the Congressional Gold Medal (1996); the Templeton Foundation Prize for Progress in Religion (1982); and the Big Brother Award for his work on behalf of the welfare of children (1966). In 1964 he received the Speaker of the Year Award and was cited by the George Washington Carver Memorial Institute for his contributions to race relations. He was recognised by the Anti-Defamation League of the B’nai B’rith in 1969 and the National Conference of Christians and Jews in 1971 for his efforts to foster a better understanding among all faiths. In December 2001 he was presented with an honorary knighthood, Honorary Knight Commander of the Order of the British Empire (KBE), for his international contribution to civic and religious life over 60 years. Mr. Graham was listed by the Gallup organisation as one of the “Ten Most Admired Men in the World” whom it described as the dominant figure in that poll since 1948—making an unparalleled 61st appearance and 55th consecutive appearance in 2017. He also appeared on the covers of Time, Newsweek, Life, U.S. News and World Report, Parade and numerous other magazines and was the subject of many newspaper and magazine feature articles and books. 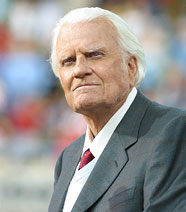 Mr. Graham lost his wife of nearly 64 years, Ruth Bell Graham, in June of 2007. Together they had three daughters, two sons, 19 grandchildren, 44 great-grandchildren and 6 great-great-grandchildren. Mr. Graham lived in their home in the mountains of North Carolina until his death on Feb. 21, 2018. 1943-45: Pastor, The Village Church of Western Springs (now Western Springs Baptist Church), Western Springs, Ill.
1945-50: Charter Vice President, Youth for Christ International, Chicago, Ill.
1950 — : Founded Billy Graham Evangelistic Association, Minneapolis, Minn.